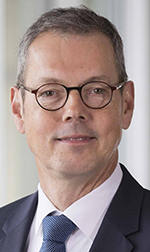 Peter Bofinger is a professor of international and monetary economics at the University of Würzburg. Since 2004 he has been a member of the German Council of Economic Experts, an independent advisory body to the German federal government. Previously he served as vice president of the University of Würzburg and an economist at the Deutsche Bundesbank. He holds a PhD and a habilitation (venia legendi) from the University of the Saarland. Bofinger is a research fellow at the Center for Economic Policy Research London and a member of the standing field committees of the Verein für Socialpolitik on monetary policy and economic policy. A focus of his research is on monetary theory and policy and he has worked extensively on issues regarding the European Monetary Union and the prospects for further monetary and political integration in Europe. Recently he has discussed the implications of alternative models for the financial sphere (real models versus monetary models) for the analysis of interest rates and international capital flows.